Will we beat last year’s record for Nashville’s Largest Burrito? You will have to join us at Sevier Park Fest to find out! 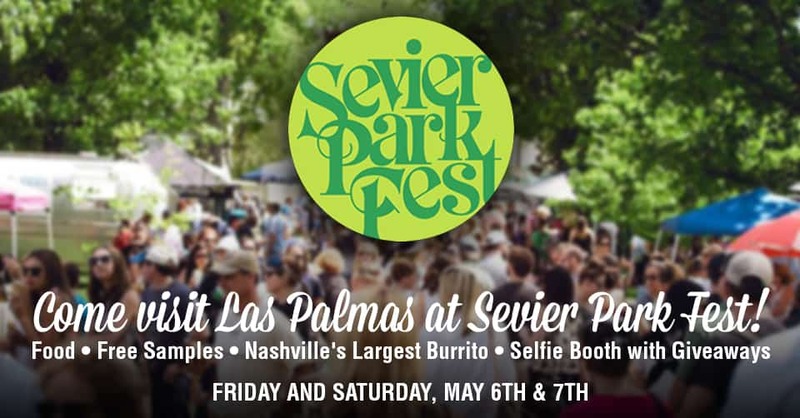 We are thrilled to announce the return of Nashville’s Largest Burrito at Sevier Park Fest 2017 in the 12th South neighborhood on Saturday May 6th. The authentic Mexican-style burrito is expected to be 7 feet long, beating our record of a 6 ft burrito at last year’s festival. Delicious samples will be available to festival attendees. We will also be serving up our renowned Mexican fare for the Friday night concert featuring The Lone Bellow, Muddy Magnolias and Family and Friends, as well as throughout the festivities on Saturday. Don’t forget to snap a photo in our selfie booth and post to Instagram with the hashtag #IWantLasPalmas to be entered to win some great prizes! Get your tickets to Friday night's event on the Sevier Park Fest Website HERE. Saturday's event is FREE and open to the public. See you at Sevier Park Fest!